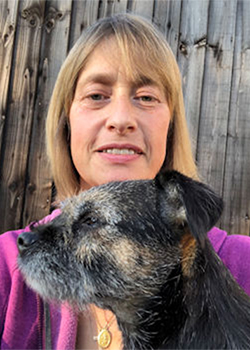 Amanda lives in Cambridgeshire with her husband Tony and three Border Terriers; ‘Obi’ (retired Therapy dog), ‘Coni’ who is an actively visiting dog and ‘Rosie’ the puppy. Amanda and her dogs visit schools carrying out the Paws & Read Scheme. Amanda also arranges local events where groups of Therapy Dogs Nationwide volunteer teams can attend. She was part of the working committee to implement the Kennel Club’s Bark & Read Standards of Practice.